Cape Ann ought to get special consideration, in our view. The following is a brief summary that is meant to summarize some of the work done to date and to suggest further research and discussion. Europeans were early in the visitation of New England, including Cape Ann. John Cabot reported in 1497 about his journey along the North American coast. By 1517, dozens of ships were fishing along the Newfoundland banks. Later, England, Spain, Portugal and France accounted for over three hundred boats that were fishing in the area. During the 1580s, Sir Walter Raleigh made his attempt to establish a colony at Roanoke in the area now known as North Carolina. John White, the governor, went to England for supplies. On his return in October of 1590, he found his colony deserted. The fate of those early colonists remains a mystery. By 1600, thousands of English boats were fishing the bays and coves of New England. Captain Bartholomew Gosnold had the honor of naming Cape Code and Martha’s Vineyard. Gosnold found that the area was pleasant enough during the summer of 1602, with an abundance of fish, to attempt a colony that did not take hold due to several problems such as conflict with the native population. Captain John Smith explored Maine in 1614 and suggested that the excellent fishing could be exploited by having stations. Also, he mapped out the area of Cape Ann (named by Prince Charles). The Plymouth experience was at a location not far from Cape Ann. Fishing crews from Plymouth did use the area for processing fish. In 1623/24, the Dorchester Company made an attempt to found a commercial venture in New England at Cape Ann. Thomas Gardner was in charge of the planting, according to Hubbard. A year later, Roger Conant came to the area as supervisor on the direction of the merchants in England. 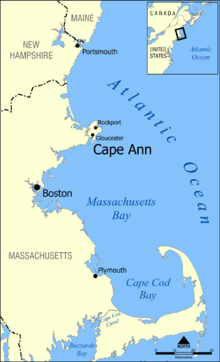 At that time, there had been growing conflict with the Cape Ann crew and those of Plymouth due to differences in opinion concerning who had authority in the area. Conant is noted as arriving in time to play peacemaker. Too, the venture never found commercial success. The Cape Ann crew did succeed in establishing themselves, by the time of Conant’s arrival, by overwintering twice. A group had spent the summer of 1623 fishing in the area. Part of this group remained and awaited the coming of the party the next year. In 1624, a house was erected using, in part, material brought from England. Too, they planted crops which were sufficient to support the group given that we have no record of the deaths that occurred later when the influx swamped the local capacity to support the population. This house, later, was seen by Higginson in Salem and termed the great house. Conant got access to the house upon his arrival. Prior to that, the occupants may have been Gardner and family. With Conant coming in to take charge, there was the first of several transitions in power that were to come. By 1626, Conant had determined that Cape Ann was not suitable for supporting the commercial expectations of the company. Hence, he asked for and got permission to move the Cape Ann crew to the area that became Salem. He and those who went with him were later to be called “old planters” to distinguish them from those newcomers who came after the arrival of John Endicott in 1628. Many have asked questions pertaining to the short list of “old planters” since many of the Cape Ann crew are not on the list. The Paine sisters, for instance, suggested that Thomas Gardner may have returned to the old country. Other stories abound. When John Winthrop showed up on 1630, his party stopped on Salem. They were welcomed with a feast, in the Great House. Too, the party went over to Cape Ann for strawberries. A proper retrospective would have Thomas staying in Cape Ann, using the house, and keeping the plantings properly maintained. Craddock wrote to Endicott that he ought to soothe the feathers of Conant and friends who had worried that they would lose their privileges of being free men. Each got a grant of a thousand acres. Thomas Gardner was not of that group of worriers. When Endicott came over, he visited Cape Ann and saw the house which was occupied by Thomas and family. After the house was moved to Salem, Thomas would have moved with his family. In 1629, Endicott mentions Mr. Gardner in a letter to London. In the latter part of the 19th century, as the 300 anniversary of the arrival loomed, there was much interest in the colonial ancestors around and about the country. Many families got acquainted with their family history and wrote books. Frank A. Gardner, M.D. authored a book on his genealogy. Too, he, and several illustrious colleagues were instrumental in establishing an Old PlanterSociety. Dr. Gardner also established the second try of the MassachusettsMagazine which published for ten-years. One section dealt with history and genealogy, including meetings of Societies. One discussion brought up during this time was that the Cape Ann crew had been forgotten in history and had not been given the proper credit. Also, Dr. Gardner tried to get Thomas Gardner and others on the old planter list. The Old Planter Society became associated with the Balch family which has had regular meetings in Beverly over the years. In review, we can describe how Thomas Gardner, with his family, remained in Cape Ann after Conant left with the “old planters” crew. There were plantings to attend. Too, the house which was the first two-story structure in New England would have been available. One might consider that this “solitary” time on Cape Ann was the first example of an idyllic life experience. Essentially, there would have been no church and no preacher. There were peaceful relationships with the natives. Too, the area was still supporting fishing. Hence, Cape Ann would have given us the first experience of the American Dream. That is, an effective pair of a man and his spouse in a non-turbulent environment would have been free to pursue those ideals we later see in writing. The upcoming 400th anniversaries ought to encourage re-looks such as this which represents the start of a series that will argue the importance of Cape Ann. 01/05/2019 -- Enduring Gloucester. How did I miss this? Commented. I guess, the focus on the western expansion that still has tales needing telling. Wait, I did a post on a story about the beginnings.